We are using pdfstamp.exe to watermark our pdfs. However, the watermarks are removable using watermark removable tools. Is there a way to restrict the "text watermarks" non removable. Please note that we use pdfstamp.exe internally in our programming language and the text we use for watermark in based on the business condition and its not static. 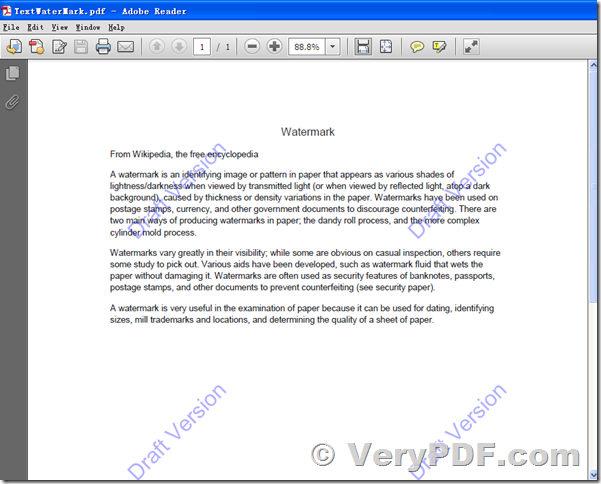 >>We are using pdfstamp.exe to watermark our pdfs. However, the watermarks are removable using watermark removable tools. Is there a way to restrict the "text watermarks" non removable. Please note that we use pdfstamp.exe internally in our programming language and the text we use for watermark in based on the business condition and its not static. Yes, we known this issue, because we have some other customers who have similar requirements like you. 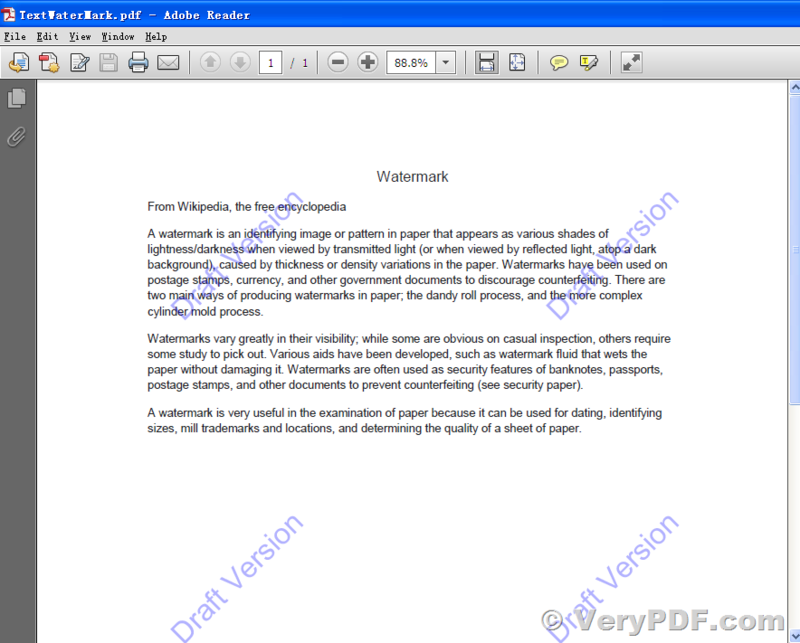 You can use pdfstamp.exe to add watermarks to the PDF pages first, and then use Image to PDF OCR Converter Command Line to convert from stamped PDF files to image based PDF files, if so, the watermarks will become permanent watermarks in the PDF files, these watermarks will impossible to be removed from image based PDF files. Most of our customers are using img2pdfnew.exe to convert from a normal PDF file to an image based PDF file, the watermark will be merged into images in the PDF file, nobody able to remove these watermarks. Here is an user's question in a forum, this user can use img2pdfnew.exe application to convert from a normal PDF file to an image based PDF file, the watermark will impossible to be removed from final PDF file. img2pdfnew.exe does support batch processing, so you can process all of your PDF files with one command line, it's so easy. I am trying to find a way to make a permanent watermark within a pdf that cannot be removed should someone be able to crack my password protection. Is there a way or a program that can accomplish this for me. If you want to keep the content as text, then no. The only option would be to flatten each page into a single bitmap image, including the watermarks, so it becomes part of the same object. A watermark in general can't be removed, but if you want to be sure you can flatten the pages. Could you tell me how to flatten a pdf to accomplish this? Can you do it to all pages in the pdf at once or better yet run a batch process to do several pdf's? BE AWARE: Once you do this all form fields, annotations, etc. become flattened and can't be edited any more. As I said, you can't flatten the watermark into the page content in a way that makes it permanent unless you convert the pages to images. Even if you flatten the OCG layer into the content, anyone with Acrobat Pro can remove it again. That's what the object tools are for. Depending on your page content, raster it will make the PDF massive, you'll lose the ability to zoom in, and of course it kills any hope of accessibility, search engine indexing, reflow and text searching - but it makes the page completely uneditable. This saves each page image into a folder, postfixed with the page number. Close the original PDF, then combine the images into a new PDF file. The first place I would look at is the authoring program to create the watermark before creation. One can make fields look like a watermark and then flatten the PDF after adding the fields and setting their values. Whether I can convert GIF image to PDF file by command line? How to convert tiff to html file? This entry was posted in Image to PDF Converter and tagged image to PDF, raste pdf, watermark pdf. Bookmark the permalink.